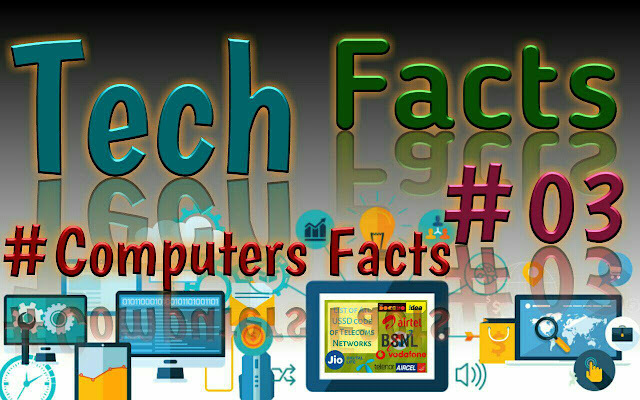 ● Read : Tech Facts #01 Here..
Amazing Technology facts about Google. ● Also Read : Tech Facts #02 Here..
Amazing facts about begging of mobiles. Here the #03 Facts about begging of Computer. 5. Around 50% of all Wikipedia vandalism is caught by a single computer program with more than 90% accuracy. 6. If there was a computer as powerful as the human brain, it would be able to do 38 thousand trillion operations per second and hold more than 3580 terabytes of memory. 7. The password for the computer controls of nuclear-tipped missiles of the U.S was 00000000 for eight years. 8. Approximately 70% of virus writers are said to work under contract for organized crime syndicates. 9. HP, Microsoft and Apple have one very interesting thing in common – they were all started in a garage. 10. An average person normally blinks 20 times a minute, but when using a computer he/she blinks only 7 times a minute. 11. The house where Bill Gates lives, was designed using a Macintosh computer. 12. The first ever hard disk drive was made in 1979, and could hold only 5MB of data. 13. The first 1GB hard disk drive was announced in 1980 which weighed about 550 pounds, and had a price tag of $40,000. 14. The original name of Windows was Interface Manager. 15. The first microprocessor created by Intel was the 4004. It was designed for a calculator, and in that time nobody imagined where it would lead. 16. IBM 5120 from 1980 was the heaviest desktop computer ever made. It weighed about 105 pounds, not including the 130 pounds external floppy drive. 17. Konrad Zuse is the inventor of the first programmable computer in the world. He did it in 1936 and named the computer as Z1. 18. The first-ever registered domain name was Symbolics.com for free. 19. Windows doesn’t allow for creation of folders tagged CON, PRN, AUX, or NUL. These are keywords reserved by DOS. 20. Russians made a computer that ran on water in the mid of 1936. 21. All the domain names such as Google, Log In or Sign Up were free until 1995. 22. Alan Turing the father of computer science.